I love the way it looks like a beautiful, intricate bindhi design, so sparkly, feminine, and elegant. It also didn't look too hard (no time-consuming florals!) so I thought I'd try it out. First step was to paint little crescents with the glitter polishes, then shape them while the polish is still wet. I used a popsicle stick but an orange stick would be ideal. Next, I painted French tips with the cream colors. I did this freehand but you can always use sticker guides of course. Then, I added the sheer glitter toppers. As you can see the tips got a bit smeared so I would advise that you kind of pat the glitter on the tips rather than paint them on. This will minimize the smearing. After I had finished I realized I should have used a slightly darker blue but I still love the results! Rhinestone designs are a fairly easy way to make seemingly ornate designs without much effort. If you're not sure what you want I recommend buying one of the multi-sets on ebay for cheap. Born Pretty Store also has a whole kit you can buy with various rhinestones, orange sticks, dotting tools, and nail glue (link is my referral link). If you're looking for nail art that is fairly easy but impressive, try this one! I think you have really pretty nails, like even without nail polish they just look really good. I really want to try the rhinestones! Does it hurt when they fall off? Aw, thank you! I just use top coat, not nail glue, so it doesn't hurt at all when they fall off. Of course, I'm sure nail glue would be more secure. The difference before you put the rhinestones on and after is very noticeable. The accents make the difference. NICE! 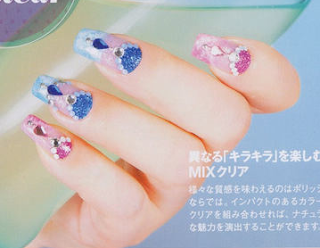 How long do the rhinestones last if you only use top coat? @Carolyn: A couple of them fell off after two or three days I think? I'm sure nail glue would hold much better, I keep forgetting to pick some up!